It can be useful to artificially tint an image with some color, either to highlight particular regions of an image or maybe just to liven up a grayscale image. 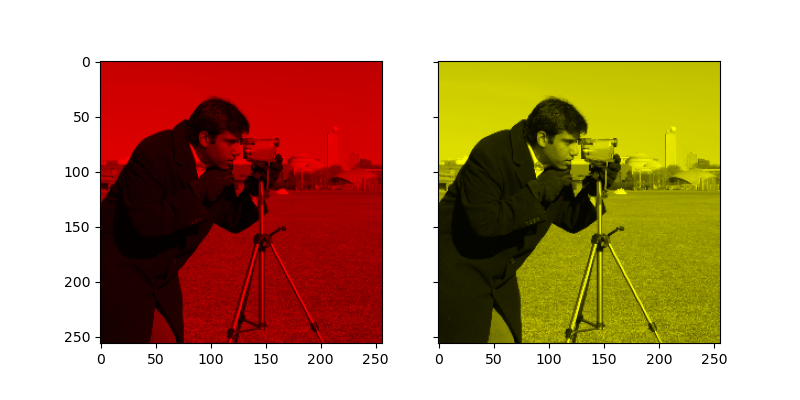 This example demonstrates image-tinting by scaling RGB values and by adjusting colors in the HSV color-space. In 2D, color images are often represented in RGB—3 layers of 2D arrays, where the 3 layers represent (R)ed, (G)reen and (B)lue channels of the image. The simplest way of getting a tinted image is to set each RGB channel to the grayscale image scaled by a different multiplier for each channel. For example, multiplying the green and blue channels by 0 leaves only the red channel and produces a bright red image. Similarly, zeroing-out the blue channel leaves only the red and green channels, which combine to form yellow. In many cases, dealing with RGB values may not be ideal. Because of that, there are many other color spaces in which you can represent a color image. One popular color space is called HSV, which represents hue (~the color), saturation (~colorfulness), and value (~brightness). For example, a color (hue) might be green, but its saturation is how intense that green is —where olive is on the low end and neon on the high end. In some implementations, the hue in HSV goes from 0 to 360, since hues wrap around in a circle. 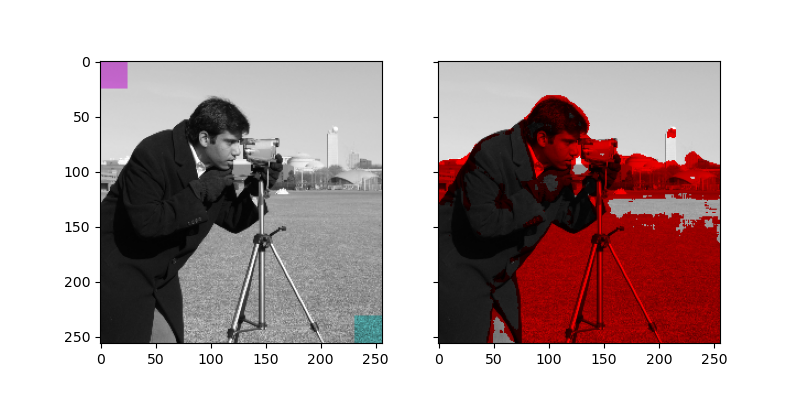 In scikit-image, however, hues are float values from 0 to 1, so that hue, saturation, and value all share the same scale. # Set image extent so hues go from 0 to 1 and the image is a nice aspect ratio. Notice how the colors at the far left and far right are the same. That reflects the fact that the hues wrap around like the color wheel (see HSV for more info).
""" Add color of the given hue to an RGB image. By default, set the saturation to 1 so that the colors pop! Notice that we need to bump up the saturation; images with zero saturation are grayscale, so we need to a non-zero value to actually see the color we’ve set. # Turn down the saturation to give it that vintage look. 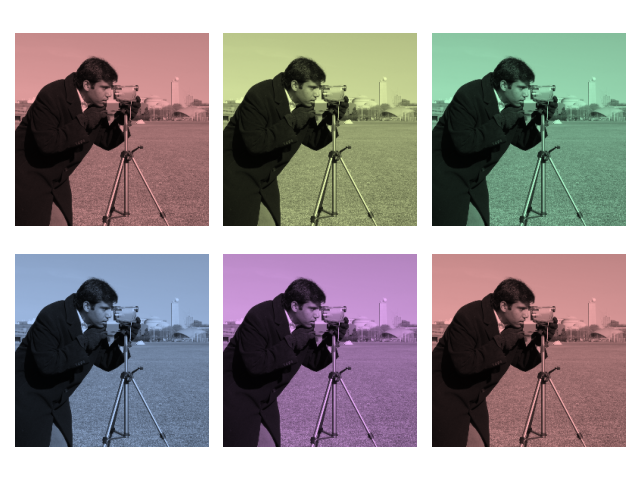 You can combine this tinting effect with numpy slicing and fancy-indexing to selectively tint your images. In the example below, we set the hue of some rectangles using slicing and scale the RGB values of some pixels found by thresholding. In practice, you might want to define a region for tinting based on segmentation results or blob detection methods. # Square regions defined as slices over the first two dimensions. # Create a mask selecting regions with interesting texture. # a set of RGB pixels (# pixels x channel). For coloring multiple regions, you may also be interested in skimage.color.label2rgb.